A little something I put together last night for a discerning client. 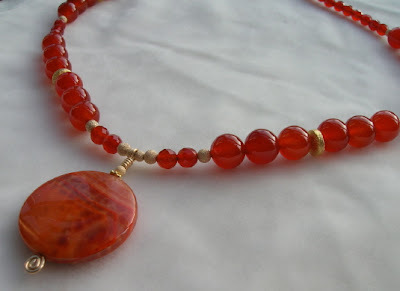 Gorgeous fire agate pendant, with small faceted and larger plain round carnelian beads, with gold filled and vermeil accents. 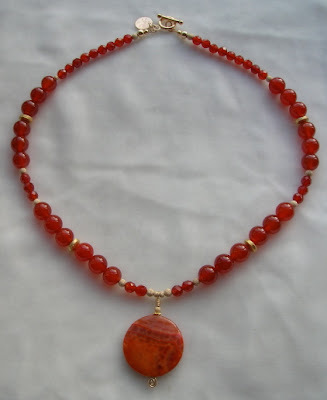 The lady for whom it was a present loves orange and was quite delighted with it! 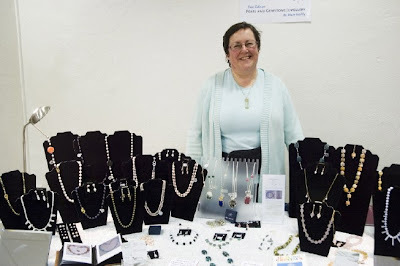 I got a second chance to work on my jewellery / jewelry 'setup' at a small craft fair in aid of the scouts troop in Mount Merrion. 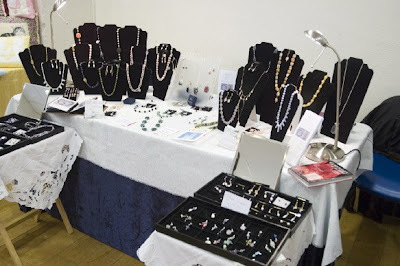 Here in a somewhat confined space I put my pearl necklaces on one side of the table and the gemstones on the other, with two trays on fold-up TV tables out front holding earrings, further necklaces and phone charms. An enjoyable afternoon where I met a lot of really nice women. Some great craft work on display! A dazzlingly sunny day dawns in Rosscarbery for my first outing to a craft fair, 205 miles away from home! The blinding morning sun calls for drawn curtains, so things look a bit dark as I put the final touches to my stand before the event is thrown open to the public at ten thirty. 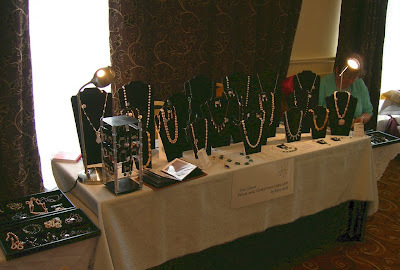 When we can open the curtains, I move my 'True Colours Pearl and Gemstone Jewellery' sign from in front of my table up to the window, for greater visibility. 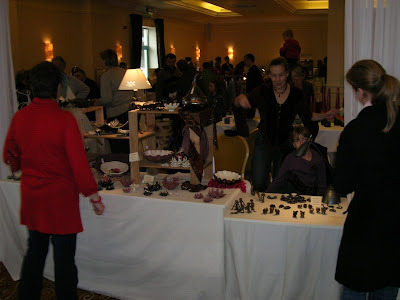 By eleven o'clock the hall is buzzing, I have never seen so many people come in to a fair so early in the morning! The standard of craft work is very high, a tribute to the organiser, Jennie White. From my stand I have a view across to a wonderful potter, Marie Stone, and onwards into the room. To my right I look over at an eye-catching jewellery display by Elly, a Dutch lady who loves colour and whose stand is thoughtfully and professionally laid out. 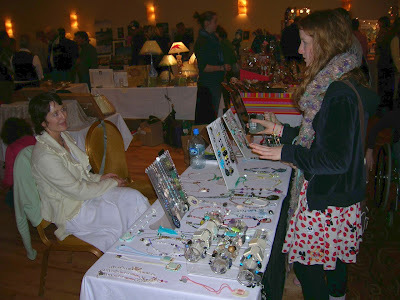 Further in to the hall, my friend Elaine, also travelling from Dublin and also making her debut, looks relaxed as she chats with a very interested customer.We both make some sales and get some very positive feedback from visitors to our stand. 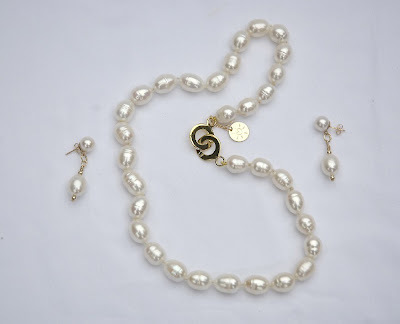 In my case, there is particular interest in the large modern looking pearl necklaces and the silver- and goldfilled wrapped pendants I have on offer. 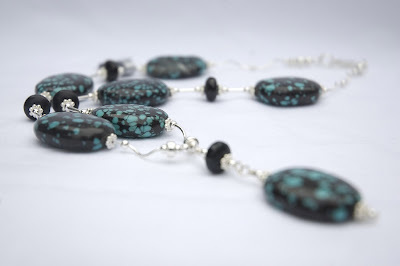 One lady feels she has scooped the prize of the show when she walks away from my stand with a silverwrapped necklace of blue chalcedony with blue lace agate and clear quartz beads paraded on a silver chain. 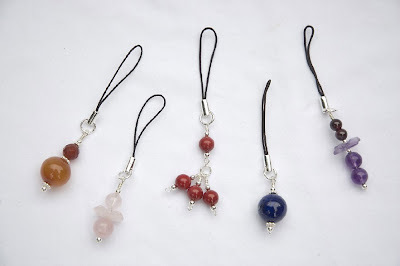 Blue lace agate - the energies for peace and communication. 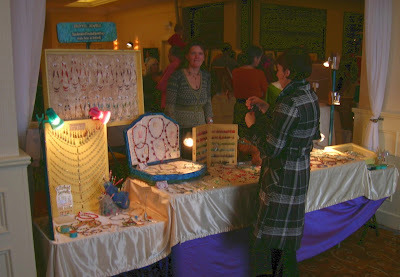 So lovely to see someone joyful at what I have made with love. 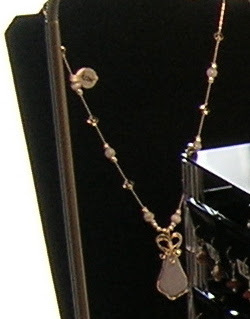 Only after I have sold it do I realise I have omitted to photograph the piece for my 'sold items' album, so the best I can do is this small cropped image, with my earring stand and my lamp blocking the view. Ah well, a lesson learned for the future! Need help? This is where you will find me!